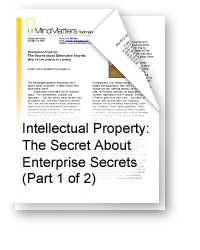 The importance of a secure, well-documented system that collects, catalogs and protects your intellectual property from idea inception to patent or trade secret protection is critical. The MindMatters Solutions’ INNOVATOR Enterprise software system is an intellectual property management software solution and tool designed to manage, safeguard and protect your intellectual property assets from their inception. Once entered, your invention disclosures are safeguarded within our intellectual property management software solution and routed only to those individuals authorized within your invention and patent review decision process to review, analyze, and decide on patent application or trade secret status. 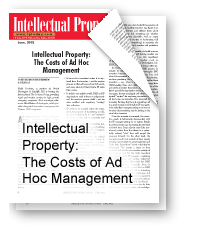 Scroll down the page to learn more about how our intellectual property management software system. The INNOVATOR Enterprise provides the solutions and tools to manage, safeguard and protect your intellectual property assets. From protecting your trade secrets to automated patent marking; from export control to invention disclosure and patent review decision and processing management; from docketing integration to document and legal studies management; from patent family management to dashboard reporting of the value and status of your intellectual property, INNOVATOR Enterprise delivers a powerful and comprehensive intellectual property software solution to manage and protect your most valuable asset, your intellectual property. The INNOVATOR Enterprise intellectual property management software has an extensive capability to protect and manage all of your organization’s intellectual assets, from inventions and patents to trademarks, trade secrets, licenses, agreements, products, and competitive intelligence. The INNOVATOR Enterprise system’s unique asset tracking allows the supervision of information down to the audit level so that you can watch for irregularities and possible security issues. With automatic snapshots, activity logs, and state-of-the art security models, your assets will be fully protected across users, teams, departments, business units, and geographies. Moreover, this capability extends into the user interface as well, helping to train users on what assets are considered valuable and how they should be protected—a key element in any IP strategy. The Snapshot feature allows users to take a “snapshot” or picture of the intellectual property at any point in time to make a permanent record of the document as of the snapshot date. The system can be programmed to automatically take Snapshots at pre-programmed times or events. The Activity Log tracks every change made to an invention disclosure or intellectual property record to provide an accurate audit trail for management. The Activity Log also tracks the activity within the system of each user, an extremely valuable tool when investigating the possible theft of intellectual property by an employee leaving the company. Advanced security features govern the departments, locations, and individuals that have access to various types of intellectual assets. 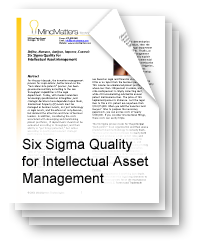 The legal department may have access to all intellectual assets while other departments and individuals may have access to only the intellectual property to which they are involved. 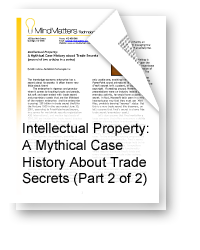 It’s only after a trade secret dispute or suspected misappropriation that companies realize that they should have been more proactive in safeguarding key trade secrets in the first place. Considering that the risk of a single dispute may cost $500,000 in legal fees alone—not to mention the toll on key management, potential damages, and even total loss of the trade secret itself—it’s not difficult to appreciate the destructive potential of even a single incident. The extent of measures taken by a company to guard the secrecy of the information; the greater the security of the system guarding the information, the better the trade secret protection. The amount of time, effort, and money expended by the company in developing the information; the more documentation collected and stored by the system, the better the trade secret protection. The robust security model built into the INNOVATOR Enterprise intellectual property management software solution provides the proper protection level of your company’s intellectual property and the assignment of privileges for viewing, editing, forwarding and analyzing innovations and trade secrets. Our security models safeguard your trade secrets and intellectual property and reduce your risks of loss. The INNOVATOR Enterprise is designed to collect, store and protect your vital trade secret information continuously throughout the innovation and development process and beyond, thus reducing the risk to your trade secrets by providing the highest level of security, as well as, documenting the time, effort and money expended on protecting the trade secret by your company. Products must be marked as patented in order to be awarded damages resulting from infringement of the patent. The INNOVATOR Enterprise enables you to quickly implement web-based patent marking. The INNOVATOR Enterprise intellectual property management software solution allows you to easily manage the product-to-patent relationship so that new patents are automatically added to product descriptions and bar codes, even in complex parent-child linkages. This automation provides for nearly instant updates to your existing products and puts you in a defensible position. Combine our patent marking with labeling systems to add even more protection to your patented products. Many of our clients create and disseminate technology information, either as an adjunct to their regular business, or as a significant end product itself. Many kinds of technology (so-called ‘dual use’ or commercial technology with possible military applications) are actually subject to significant U.S. government restrictions on ‘export’ to foreign nationals, and even to certain U.S. companies who engage in certain kinds of research and production. 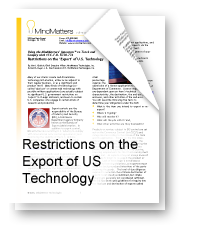 Compliance with US export restrictions via export licensing is mandatory, but with features of INNOVATOR Enterprise, in conjunction with guidance from the appropriate U.S. government agencies, such compliance need not be especially troublesome. The INNOVATOR Enterprise provides a variety of ways to address export requirements. Easily manage and report on the relationships of all of your IP! The INNOVATOR Enterprise intellectual property management software solution has an extensive capability to manage and report on the linkages between ideas, inventions, patents, products, legal studies and contracts with INNOVATOR Enterprise’s family management features. Multiple fillings generated from from one invention disclosure, or international filings related to one or more US Patent Applications are easy to track and manage. Safely storing and protecting all of the documents and drawings associated with your IP is a tremendous time-saver! The INNOVATOR Enterprise intellectual property management software solution safely stores, protects and displays all of the documents and drawings associated with your invention disclosures, patent applications and patents. A new version level is assigned and displayed on each document once uploaded, storing and displaying a history of your documents. The PDF Compiler within INNOVATOR Enterprise provides the ability to export all invention disclosure documentation, attachments and drawings to a single PDF file – a huge time-saver. 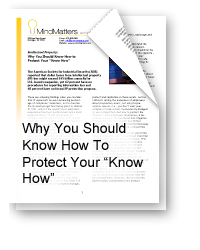 Prepare detailed information packages for review teams, outside/inside counsel, and other departments containing the complete history/docket of your intellectual property. The PDF Compiler also provides the capability of including any linked or associated IP records and attachments to be included in the single PDF file. The INNOVATOR Enterprise intellectual property management software solution provides the tools of documenting and saving your Legal Studies for secure and easy access. Information such as Patentability studies, Patent Clearance studies, Freedom to Use and Patent Landscape studies. These studies can be linked to your invention disclosure, patent application and patent records. Why keep these records in separate files when you can store all your Legal Studies records conveniently and safely within the invention, patent application and patent records within INNOVATOR Enterprise. Integrating to your Docketing System makes updating both systems fast, easy and secure. The INNOVATOR Enterprise intellectual property management software solution provides the capability of integrating with your your docketing system, as well as, your outside counsel’s docketing system, automatically updating the INNOVATOR Enterprise’s records with docketing system changes, such as office actions or changes in patent application status. The docketing system can also receive automatic updates from the INNOVATOR Enterprise, such as approved invention disclosures. “First-to-File” – It’s vital to your company to facilitate faster throughput of your invention processes! Your invention process is a critical factor in your competitive position. It is vital to your company to facilitate faster throughput between business, legal, and technical groups to get your innovation to market faster. INNOVATOR Enterprise intellectual property management software solution can manage this process by facilitating faster throughput and accountability. An automatic IP-specific workflow process routes potential IP to any number of various Portfolio Managers, IP Attorneys, Patent Agents, and Reviewers—all while creating tasks and documenting where the IP is in the process, and next steps. The inventors are the drivers for your process. While inventing is critical to your organization’s long-term success, the process of creativity is something that can’t be forced. Give your inventors all of the tools they need to simplify the process and improve participation. – Our Inventors Portal is designed to give inventors what they want, like a draft/private mode, duplicate searching, reward tracking, and easy progress monitoring. 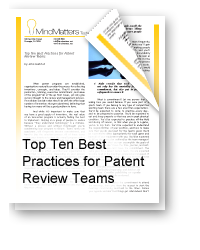 The Patent Review Team is the heart of your IP decision process. Their expertise and speed are what determines not only the volume, but also the quality of your invention pipeline. Making sure that submitted inventions are “reviewer ready” reduces wasted time chasing down inventors for additional invention information, details, and insures completeness. – Our solution provides your patent team a Patent Review Dashboard with the workflow engine and tools to expertly analyze, review and prioritize incoming inventions, guaranteeing a high-quality stream of intellectual property. The IP Department is ultimately responsible for the entire invention process. Do you have visibility into your current workflow? How many inventions are in process? How long is it taking to be reviewed? What does your portfolio look like? INNOVATOR Enterprise provides you with the answers to all of these questions and much more! Learn more about some of the time-saving benefits of INNOVATOR Enterprise, like improving your patent review throughput by as much as 67%! What will you tell your board and shareholders when they ask you to list your company’s core proprietary assets, their location and who’s working on them? It’s equally important that you have quick access to the status, progress and results of your invention and patent application pipeline. The INNOVATOR Enterprise offers many reports to provide information on a range of areas, such as user participation and the health of your innovation and invention process. One of INNOVATOR Enterprise’s most valued reports is the Pipeline Report. The Pipeline Report breaks down the status distribution of innovations that are active in the review process, and filters allow you to quickly identify bottlenecks in the innovation process, allowing you to quickly identify where innovations are being delayed within your review process. The Review Committee Report identifies decision processing time within each Review Committee, how committees vote, and how individual Review Committee Members Vote. Challenge Results: Did your Timed-Challenge achieve your goals? This report provides the total number of submissions, participating users, participation rate, ROI details and more. Real-Time Monitor: Is participation and activity where you want it to be? Get statistics by week, month, last 30-60-90 days and yearly. View log-ins, ideas, comments, current logged-in users and more. 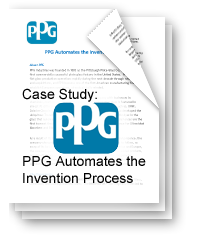 Innovation Throughput: Are your inventions getting processed fast enough? Review total inventions submitted, inventions at each stage and average days at each stage. Metrics Summary: Need a quick look at your program’s statistics–get a quick overview of your innovation program’s activity and benefit details. User Statistics: Are you interested in the activity of particular users? Review the log-ins, submissions and statistics of each individual users activities. Completed Projects: What is the quantity and value of your completed projects? Drill down by category, division and location for the results of completed projects. Make your own Report: Need a report that we don’t offer? Create and save your own portfolio of reports for easy access at any time with the INNOVATOR Enterprise Custom Report Designer. The information above covers only a portion of the many ways MindMatters Solutions can help you supercharge and facilitate faster throughput and visibility of your invention and patent review processes while safeguarding your intellectual property and trade secrets. The best way to gain a complete understanding of how INNOVATOR Enterprise and the experts at MindMatters Solutions can help your business is to contact us to begin a discussion of your invention and intellectual property needs and requirements. We’ve created a proven set of best practices for innovation, product development, and invention & intellectual property management. Visit our White Paper Library.